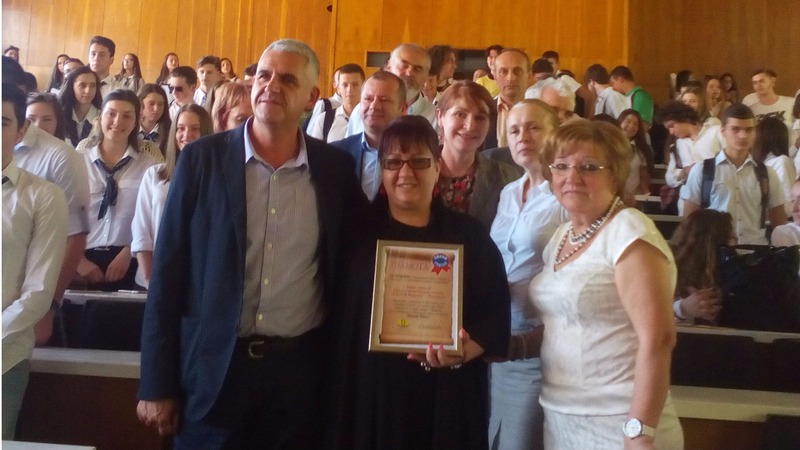 Radoslava Ivanova, a tenured Bulgarian Language and Literature teacher of the N. Stoichev Tourism and Food Technologies Vocational School of Razlog won the 2016 Favorite Teacher of the Pirin Region Competition organized by the Struma Newspaper and supported by Groma Hold. Radoslava Ivanova won thanks to the recognition of her students and their parents. A bit overwhelmed with excitement, our Teacher of the Year delivered an emotional speech in which she thanked the staff of the N. Stoichev Tourism and Food Technologies Vocational School of Razlog and everyone who voted for her. Damiana Gruncharova, a physics and foreign language teacher at the Acad. L. Stoyanov Language School of Blagoevgrad, came in second. Alexander Mandzhiev, a Bulgarian language and literature teacher of the Science and Math High School of Gotse Delchev finished third. The fourth consecutive installment of the first-of-a-kind Favorite Teacher Competition organized by the largest daily newspaper of the Southwestern Region started in October. Eligible to vote were teachers, parents and readers of the newspaper’s site. The objective of this competition is to promote trust in Bulgarian teachers and intellectuals whose selfless efforts ignite the spark of curiosity and broaden the horizons for anyone who wishes to forge a better future for themselves. All schools that took part in this year’s installment of the Favorite Teacher Competition were introduced with brief yet impressive presentations focused on their strengths and innovative approaches to teaching. What type of a person should your teacher be to earn a place in your heart? This is what the contest organizers asked the audience on Struma’s internet site .